Day 06 Namche Bazaar to Phortse Thanga (3600m Beautiful view of Tengboche monastery and verdant Phortse Plateau on east. Good views of Thamsherku(6608m) Kang Targaa(6685m) and Taboche(6367m). Walking through in beech, rhododendron and oak forest till Dole. After here landscape gets rocky and only few trees are left. 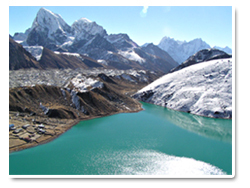 Trail follows the immense frontal moraine of the Ngozumpa glacier to the Gokyo lake. Ngozumpa is largest glacier in Nepal. Mean the time passing waterfalls, which are often frozen. The panoramic view from the summit of Gokyo peak is the highlight of Gokyo. Otherwise visiting to the fifth lake will be a good trip. The trail continues to the east side of valley. It is a succession of ascents and descents along the Dudh Kosi river. Follow the trail as a U shape. Over looking Pangboche, which shelters the most ancient monastery in the Khumbu region. Trail continues towards to Tengboche monastery, situated in a glade surrounded by dwarf fir trees and rhododendrons, and considered as the main Buddhist center of Khumbu. Trail continues ascents and descents. 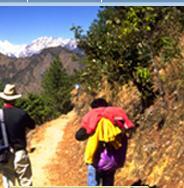 Crossing the Dudh kosi river and retrace to Namche bazaar.it is a pleasant and easy walk with panoramic views. Walking through the forest and rocky cliff, passing the villages and terrace to reach to Lukla. Day 14 Phakding-Lukla (2860m) - 3 hours, reconfirm the flight tickets. Day 15 Fly to Kathmandu for 45 minutes from Lukla.